Ever since I made my Chocolate Lip Butter I’ve been completely smitten with it, so naturally I want more of it in all kinds of different variations. 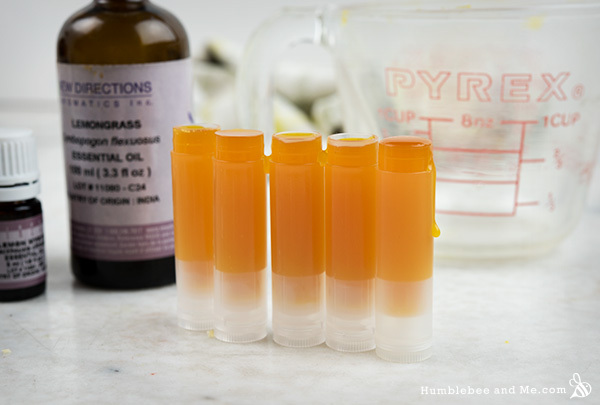 I’ve been wishing for a citrussy lip treat for ages, but since citrus essential oils are photosensitizing, I’ve never made one (sunburnt lips are the pits). This lovely, sticky, buttery lip treat uses some citrus-esque essential oils to get that bright, fruity hit of summery goodness without the risk of earning myself a pair of blistered, sore lips. 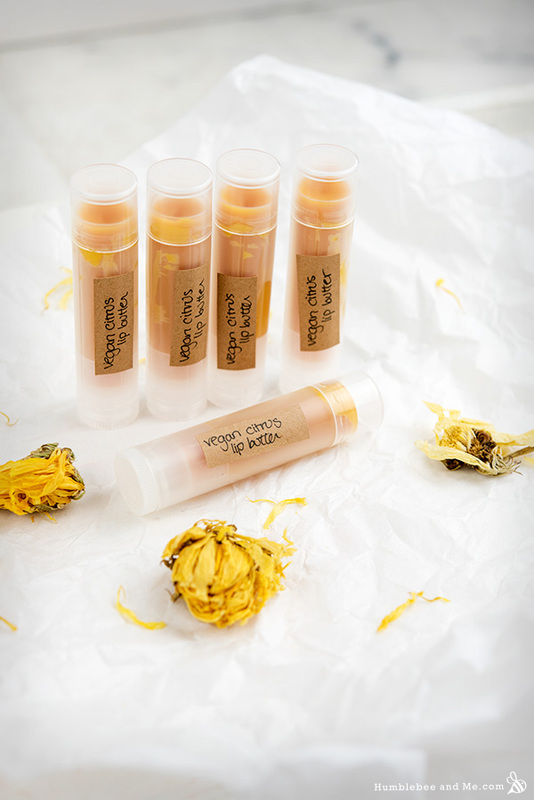 Bring on the vegan citrus lip butter! 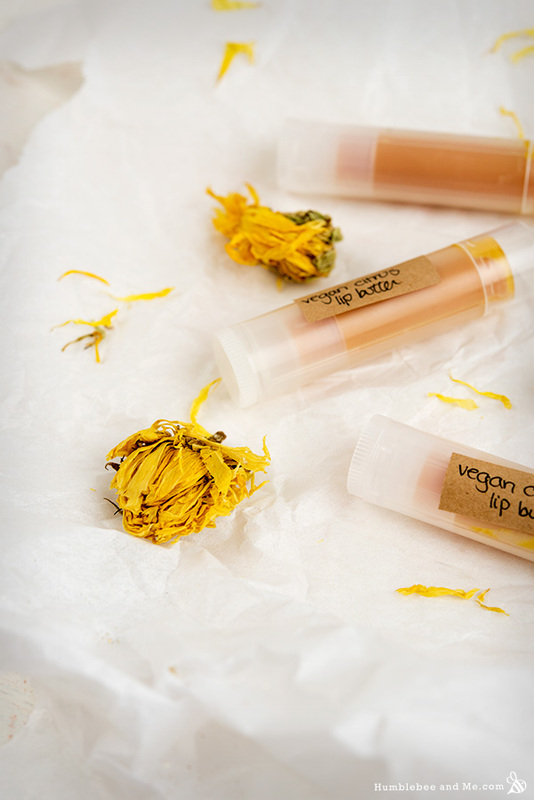 This super simple vegan citrus lip butter needs just three ingredients for its base, and then three for its citrussy goodness. Rich mango butter is blended with glossy candelilla wax and sticky lecithin to create a thick, tacky base that will stick around for ages, keeping dry lips hydrated. To that I’ve added a blend of lemongrass, bergamot, and lemon myrtle essential oils. Lemongrass and lemon myrtle are both lemon-y, without being actual citrus fruits, while bergamot essential oil is easily available in a bergapatene-free version that’s had its photosensitizing compounds available (make sure that’s true of your bergamot!). My favourite thing about my Chocolate Lip Butter and other lip balms I’ve been hooked on lately (like my Sticky Coconut Lip Balm) is how it’s a bit tacky. That rich, tacky texture means it sticks around on your lips for ages, locking in moisture and negating the need for multiple applications. It doesn’t glide like many of my other lip balms, but if you’ve got dry lips and hate re-applying lip balm, you are going to love this stuff. 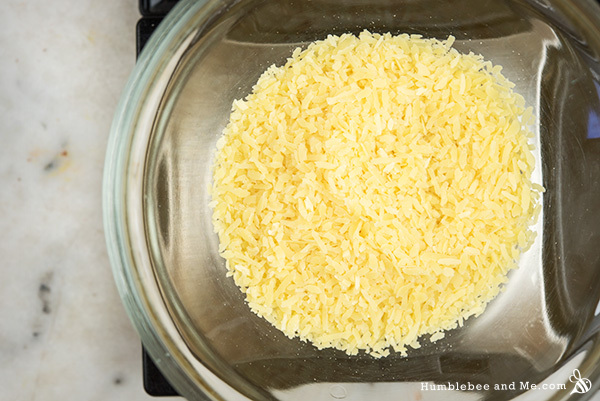 Weigh the mango butter, candelilla wax, and lecithin into a small heat resistant glass measuring cup. Place that measuring cup in a small saucepan that has about 3cm/1″ of water in it, and place the saucepan over medium low heat on your stovetop for about twenty minutes, or until everything has melted through. Remove the measuring cup from the hot water bath and dry off the outside of it. 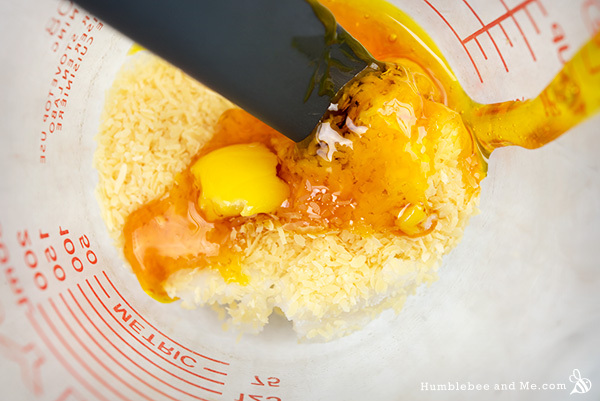 Stir to combine with a flexible silicone spatula, and then stir in the essential oils. Pour the liquid lip butter into lip balm tubes (this recipe fills approximately 6) and let it set up before using—that’ll take about ten minutes. Wipe the tubes down with some paper towel before capping and labelling (I love these labels). Enjoy! I don’t recommend increasing the amount of lemon myrtle essential oil used as we are nearing the upper recommended use limit of for it. Thanks for reading! I’m afraid I don’t know of any suppliers in South America. Have you ever tried ‘Orange Butter’? I make a similar product as your citrusy lip butter but I flavor it with Orange Butter and for a lark, I sometimes add a little peach flavoring, for a really nice Fuzzy Navel flavor. Anyway, I just wanted you to know it’s really nice to work with. And super yummy!!! It actually tastes/smells just like orange Popsicles, and it’s Organic. Mmmmm. I haven’t! From my reading it’s not a true butter (at least the stuff NDA sells isn’t), it’s hydrogenated soy bean oil + citrus essential oils, so I’m not all that interested in it. Do you have issues with phototoxicity? The stuff at NDA is listed as being potentially phototoxic, and from looking at the INCI, I assume it would be. Just curious 🙂 I assume it does smell amazing, though, with all that orange EO in there! 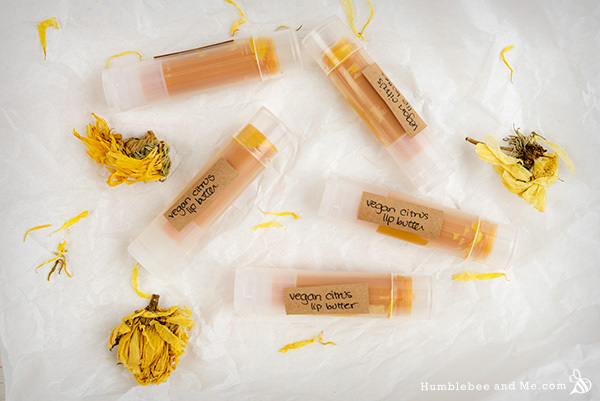 i know you said no substitutions, but have you ever tried lanolin in a lip product? It’s quite tacky. Can’t wait to try! I’ve got some steam distilled lemon essential oil, I think that would work too. Hey Anne! 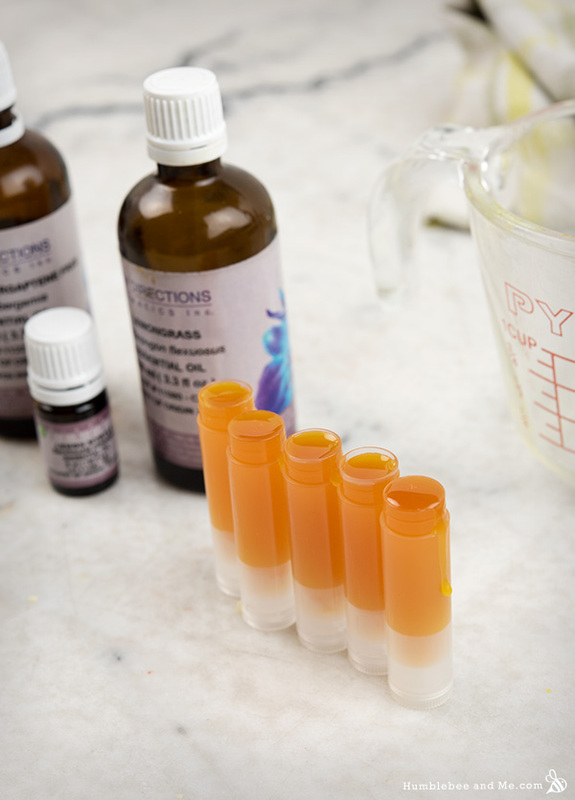 Steam distilled lemon essential oil will be photosensitizing and will result in sunburnt lips 🙁 That’s why there are no straight-up citrus essential oils in this recipe! I was looking in Robert Tisserand’s ‘Essential Oil Safety’, and it notes that expressed lemon essential oil is phototoxic, but that steam distilled lemon essential oil is not (pages 305-306). It has to do with the photosensitizing molecules being non-volatile, so they do not pass over into most steam distilled citrus oils. Ah, interesting! I went to get a copy and it’s $117 on Amazon… yikes! Was your copy in that price range, or is this Canaadian Amazon working me over again? Oh, I think it really is that expensive. I somehow managed to download the ENTIRE pdf of the book through some strange link out there on the wonderful world wide web. I will see if I can find it again. It is an excellent reference. Sadly, the library here in Vancouver does not have it. These look like they would smell so good! Do you just cut the labels to fit your tubes? I can’t wait to wait these!! I have a favorite recipe that a make with mango and coffee butters. I have palm kernel flakes; can I use that, same weight as listed in this recipe, instead of liquid soy lecithin? Er, no. They really have absolutely nothing in common beyond solubility. I’m curious, why did you think they would be interchangeable? It worked beautifully, by the way. I used it. Should I add preservatives into the solution? As I know lecithin is easy to decay. Thanks. No—no water, no preservative. Lecithin is made up entirely of fatty acids, so it shouldn’t spoil any faster than the other oils and butters in this recipe. Can you use powdered soy lecithin instead of the liquid form in this recipe? This recipe looks amazing. I will try it as soon as I can get all the ingredients together. 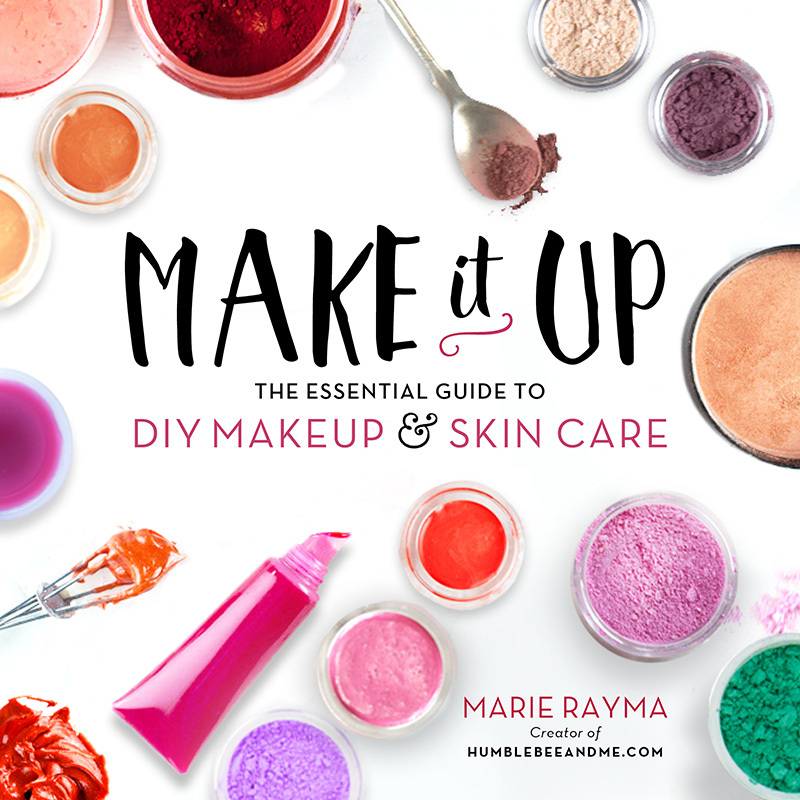 I do have one question….what if I wanted to add in zinc oxide to make it an spf lip butter….do you have any knowledge on this…and if so …what would the spf be calculated at? How do I measure 3/128 tsp?